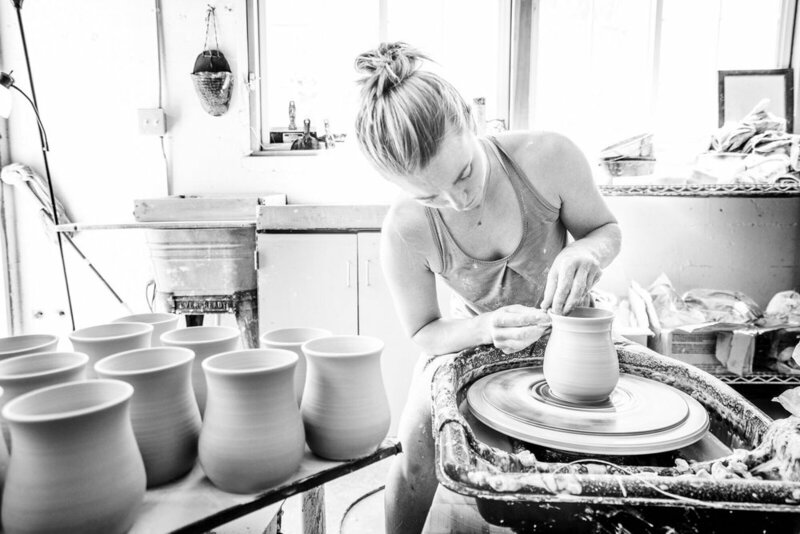 My time behind the wheel began in 2006, when I took a pottery class as something fun to do with a friend. Many classes, countless blocks of clay and a decade later, what started as a casual hobby has evolved into a deep creative passion. In 2016, inspired to slow life down and focus on my art, I left my office job to pursue pottery full-time and started Alpine Earthworks. Outside of pottery, my passion lies in exploring the mountain environment through climbing and skiing, and the time I’ve spent among peaks around the world remains my primary artistic inspiration. The small studio where I create Alpine Earthworks Pottery is located in a creekside hydroelectric power plant nestled in the forest of Little Cottonwood Canyon, just outside Salt Lake City. As my time among the high peaks of the world provides the creative inspiration for my pottery, the frigid snowmelt that flows from the Wasatch Mountains powers my wheel, lights and kiln—my pottery is both a literal and figurative product of the mountains. I strive to create artistic and inspired pieces that are not only beautiful, but serve as functional parts of everyday life. Coffee mugs, bowls and plates of all sizes, serving platters, wine goblets, and decorative vases are a few of the pieces that regularly come out of my studio.